The world’s most valuable company, Apple Inc (AAPL.US) reported three straight quarters of lower year-on-year sales and its first annual sales decline since 2001, as was expected. Apple released its earnings result for the fourth quarter of its fiscal 2016 after the closing bell, posting earnings of US$1.67 per share on US$46.9 billion of sales. The profit result was 1 US cent/share above the consensus forecast and the sales result was in line. In the same quarter last year, Apple reported $1.96 per share in earnings on US$51.5 billion of sales. Net income of US$9.0 billion in the September quarter was 19% lower than a year ago. Apple shares, which have risen over 20% since its last earnings report, fell 3% in after-hours trading post the result. Apple is forecasting a return to revenue growth in the run-up to Christmas, after reporting a 9% decline in sales during its fiscal fourth quarter. Demand for the iPhone 6S failed to match its blockbuster predecessor. Sales for fiscal 2016 were down 8% to US$215.6 billion. Apple sold 45.5 million iPhones in the three months to September 24, down 5% on a year ago but broadly meeting analysts’ predictions. For the December quarter, which is typically Apple’s most lucrative, the company is forecasting sales of US$76-78 billion, at least 1% up on the same period a year ago. Alongside strong demand for the new iPhone 7, Apple is benefiting from rapid growth in its services business, which includes the App Store and Apple Music. Revenues from services increased 24% to US$6.3 billion in the September quarter, making it Apple’s second-largest source of income after the iPhone following another sluggish performance by the Mac and iPad. Investors expected the iPhone maker to take advantage of Samsung Electronics’ current weakness in the smartphone market (after withdrawing their fire-prone Galaxy Note 7 model) and issue a robust holiday sales forecast. 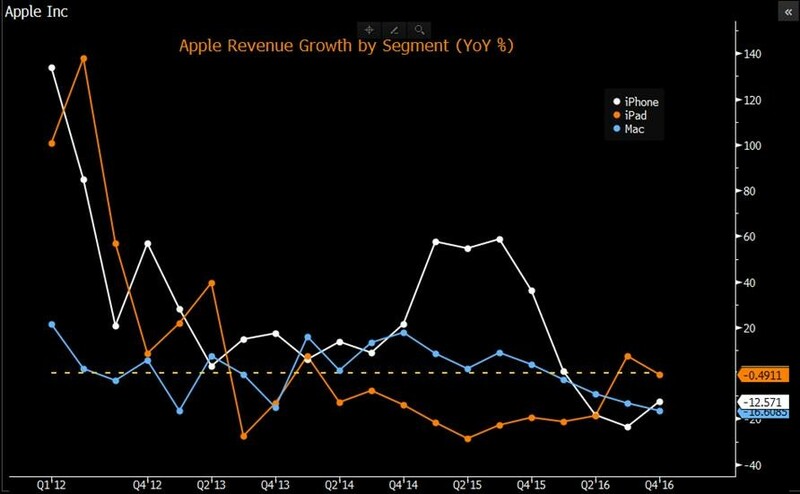 When the revenue projection was barely higher than analysts’ estimates, Apple’s share price fell in extended trading. Faith in Apple’s growth prospects – already rattled by lower-priced competition and saturation in the smartphone market – was weakened by Apple’s sales numbers in China. The company’s revenue in China, the driving force behind stronger sales in 2015, declined 17% in the fiscal year, prompting analysts to question the growth outlook. International sales accounted for almost two-thirds of Apple’s revenue in the September quarter. Efforts to outperform last year’s US$75 billion in holiday quarter sales are rendered harder by a US$548 million patent infringement payment Apple received from Samsung a year ago as well as by the US dollar’s gains. Pent-up appetite for the larger-screen iPhone 6 Plus and 6S Plus had also accounted for much of the demand from China, which has now been at least partially satisfied. Those factors will make it difficult to achieve much year-on-year growth in the December quarter, according to the CFO. Apple said its forecast for gross profit margin in the December quarter is 38% to 38.5% (compared to 38% in the September quarter). Analysts were expecting a higher gross margin of 38.9%. Back in 2012 Apple’s gross margins were nearly 10 percentage points higher, highlighting how much more competitive the marketplace has become. The average sales price of the iPhone fell to US$619 in the September quarter from US$670 a year earlier as some customers opted for the cheaper, smaller iPhone SE over the higher specification 6S and 7, which was introduced on 16 September, too late to have much impact on the latest result. The average price should recover by the end of the December quarter, according to the CFO. There is a lot riding on the iPhone 7, with Apple yet to prove that it can recover its growth groove without Steve Jobs. Competition is stronger, margins are lower and the next “killer product” is elusive – it certainly isn’t Apple Watch, sales of which fell an estimated 72% year-on-year in the September quarter. With Apple trading at a 12-month forward PE ratio of only 13x, compared to the S&P 500 average of 16.6x, the market is not convinced that Apple is about to get its groove back.